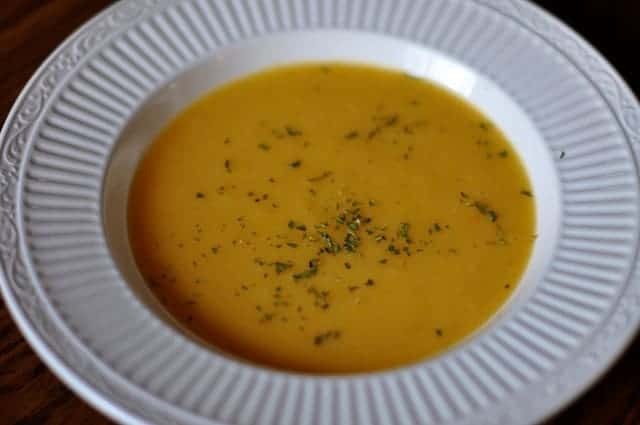 Butternut Squash and potato soup is a delicious and easy to make creamy soup that is hearty and filling. I personally love potato soup, and I love butternut squash soup, but when you combine the two, and add a touch of citrus, you have something really unique. This soup came about through a trip to the local farmers market, during the winter there is lots and lots of squash available. Being my eyes are always bigger than my stomach, I bought an incredibly large amount of squash last weekend, and this needed to turn into something else. I had wanted to do make a butternut squash soup for a long time, but in my recipe research, I found a recipe from the Le Cordon Bleu cookbook that suggested citrus and potatoes. Citrus has a wonderful touch to this soup that is a little unexpected, but it was a bit hit with my Thursday evening class. If you want to make this vegetarian omit the chicken stock, and use vegetable stock instead. Enjoy Butternut Squash and potato soup with a hint of citrus. In a large pot add butternut squash, potatoes, orange peel, and chicken stock. Turn heat up to a medium high heat, and cook potatoes and squash until softened. Remove orange peel. Use either an immersion blender or a food processor, and puree until the soup is smooth. Add heavy cream, nutmeg, taste and season with salt and pepper. This soup reheats very well. Other things you could add with this soup, would be about 1 teaspoon of curry, or even adding a chopped onion to the soup when boiling the potatoes and butternut squash would also be quite tasty. making this soup tonight so easy to make added onion and curry to it and awesome makes it very savory!